“The future of watches” title is a bit grand for this brief post, but this is somewhat of a companion piece to The future of tablets and the context of both is the evolution of computing devices. In the case of tablets we are still figuring out their role in the ecosystem after many years and over four since the initial iPad, the first breakthrough tablet. It will also take some time, and development, to see where smartwatches fit in, but it is now a much more interesting question. The Apple watch announcement stumped many commentators who needed extra time to digest it. A reasonable reaction given neither product nor platform are done yet. This makes it a bit difficult for technology, market, or financial analysts to answer questions like what the Apple watch is really for, whether it is a new product category, will it be another breakthrough product for Apple, how it will change the mix of Apple revenue, do I actually need or want one. Communication has been the killer app for computing at least since the Web and is why smartphones are the current king of the hill. Smartwatches are the most likely next-in-line competition to smartphones, certainly more so than tablets or glasses, before we enter the world of implants, stick-ons, or other fashion accessory choices. Smartwatches with phone functionality could surpass smartphones as the planet’s most popular personal computer: easier to carry around, potentially cheaper. Apple would not be investing so heavily if they didn’t expect smartwatches to overtake or at least approximate the success of smartphones. They are betting large on the watch becoming a general purpose computer in the same way the iPhone has. It doesn’t make sense for Apple to invest much in accessories, or niche markets. Even fitness is not interesting enough in itself. However, fitness is a great way to enter into the much larger healthcare opportunity, which in turn provides an environment to learn about new user experience technology and the complex device integration and data sharing necessary for it, and other complicated applications of general purpose computing. The iPhone would also benefit. This path also has the advantage of providing cover. Rich ruminating… Ben Evans: Ways to think about watches. Compared to other smartwatches… Rachel Metz: Is This the Smart Watch You’ve Been Looking For? The future of tablets isn’t what analysts thought a year ago, or even last fall. The market for PCs continues to decline (but at a slowing rate: IDC, Gartner), yet tablet growth is also slowing forcing many analysts to scale back their forecasts. Smartphone growth is slowing as well. There is a lot of discussion, mainly from an investor point of view about why: saturation, price points, supplier market share, etc., that are relevant for both business and consumer markets. Recently the focus has been on iPads because of Apple’s earnings call but the trend is not limited to Apple. Why aren’t tablets taking more share away from PCs? Given the phenomenal growth of tablets the last few years, their computing power, and the large overlap of general use cases shared with PCs (email, browsing) it did seem that tablets were on track replace PCs in large numbers. But the use case overlap was not large enough to support the forecasts. Tablets are tweeners, fighting for space between the superior communications of smartphones and greater productivity of PCs. Being in the middle is not normally a desirable spot for a product, but tablets excel at information and entertainment consumption and this middle is a pretty big and happy place to be. What do we use PCs for? For years we have been using PCs for some combination of productivity, information / entertainment consumption, and communication. PCs were largely designed and most useful for productivity, whether business or personal, and that’s why we bought them. As PCs evolved and became capable and appealing for information/entertainment consumption and communication we bought more of them. And at some point whatever motivated us to buy a PC, our actual use of them flipped – we now spend a higher percentage of time using our PCs for information / entertainment consumption and communication than we do for productivity. And of course this is the domain of tablets and why they have taken as much of the PC market as they have. But tablets are simply not as good as PCs for a large number of productivity applications. Until they are this will act as a governor on tablet growth and allow for a shrinking but still large market for PCs. So far, Apple’s bet has been to keep the iPad simple, rigidly so perhaps, rather than creating a neither-nor product: No longer charmingly simple, but not powerful enough for real productivity tasks. But if the iPad wants to cannibalize more of the PC market, it will have to remove a few walls. I would say Gassée’s post is from the point of view of a user who would like to replace his PC with an iPad but can’t, that this is a larger cohort than enterprise users or even power users, and that this is the best way to think about the productivity penalty portion of slowing iPad sales. What would make a significant dent in the iPad’s productivity penalty? Microsoft Office support alone is necessary but not sufficient. A better solution for text entry than accessory keyboards, smooth and rapid app switching, and easy file access would each make a big difference. See below for links to other thoughts. There is also a maddening and ironic side effect of using iPads for industry applications where they are productivity enhancers. For example, I used to be able to choose between an iPad (mostly research and entertainment) and a laptop (mostly work) for most trips, but a couple of my current projects include working with apps that only run on the iPad. I can’t be productive without having both an iPad and a laptop. Even in the office I often need both within reach. Unfortunately this situation is likely to get worse as more iOS, (and Android!) productivity apps appear. I don’t know Benedict, but I picture him smiling devilishly as he composed that tweet. As well he should have. The more types of computing devices there are the more complicated figuring out use case fit is going to be. The future of tablets seems promising in the near term since neither PCs nor smartphones can match their information and entertainment consumption experience and tablets will get better at aiding productivity. The better they get the more market share they’ll take. And of course we haven’t seen all the new industry apps where the tablet form factor and interface is a net productivity advantage. On the other hand, the right kind of user interface – perhaps a high resolution holographic interface not dependent on form factors for projection – would free us from our quaint categories of PCs, tablets, smartphones, smartwatches, glasses, and be truly disruptive. Once computing power and user interfaces become independent of physical size all bets are off. The blog on our sister site, gilbane.com, is the place to tune to for our series of speaker spotlights and general updates about our upcoming conference in Boston. Here, I’ll be highlighting a few conference sessions and why we have decided to include them. Digital experience designers are familiar with the approach of responsive design even if they haven’t used it. If they have used it they know it is not quite as easy as it first sounds, and the popularity of responsive design courses suggests there is a still a lot of learning going on. But even if you don’t need to understand the code, if you are a marketing manager you need to know what you can expect responsive design to accomplish and what level of effort it entails. Tuesday, December, 3: 2:40 p.m. – 3:50 p.m. Responsive design has been around since the early days of the browser wars, but as mobile channels grew it became both more important and more complex. Gone are the days when new digital channels, form factors, and other device characteristics can be anticipated and digital strategies need to reflect this new reality. 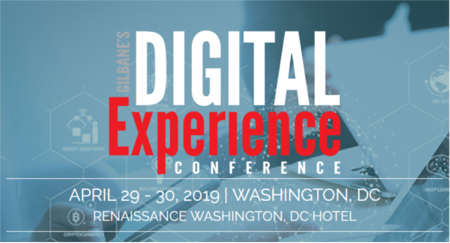 This session will provide multiple perspectives on what responsive design can do, what its limitations are, and what its future challenges are. Are You Prepared to Create Content for the Internet of Things? We’re big believers in the potential for learning from colleagues in other industries. There are many shared challenges crossing vertical boundaries not always obvious because of different vocabularies, and often a gem can be found in the variety of solutions, or an idea can be sparked by a slightly different lens on the problem. The publishing industry’s influence on computing and digital experiences goes way back and is especially applicable horizontally – markup languages, style sheets, electronic type – and of course multi-channel publishing. This is why we have usually included a publishing track in our conferences. This session looks at how a couple of publishers have dealt with some thorny multichannel publishing issues. In this session two publishing organizations report on projects that involve moving publications and existing content from print to multi-channel digital. Business Insurance, part of Crain Communications, implemented a digital publishing strategy that supports interactive digital content and content reuse across print, Web, iOS, and Android, all based on HTML5. Wolters Kluwer Health now creates textbooks with versions for print, multiple eBook formats, and integration with Learning Management Systems and other advanced learning tools. As part of their multi year initiative they report on a recent project where they implemented round tripping between XML and author-editable Word documents, and discusses the technical and organizational problems they solved. Dave White, Chief Technology Officer, Quark Software Inc.
How Should Your CMS Fit into Your Mobile Strategy? There are many answers to this question, but the right answer for you will depend on what other components make up your digital experience management system, how they integrate with other enterprise systems, the types of content and apps and mobile platforms you need, existing developer expertise and tools, and so on. CMS and DXM vendors have to work through the possibilities with their customers and partners so are a valuable resource for helping you think through some of the options. T5. How Should Your CMS Fit into Your Mobile Strategy? Wednesday, December, 4: 9:40 a.m. – 10:40 a.m.
As analysts will tell you, web content management systems are now, or should be one of the core components of a larger digital experience management strategy. There are lots of questions about what this means in practice, but this session focuses specifically on how your content management system(s) can or should support your mobile presence. Should your CMS manage all mobile content? Should that include apps as well? Is mobile content delivery by the CMS active or passive? Where does the delivery layer reside? Is data incorporated by the mobile app or by the CMS? Should you create a separate system just for managing mobile content? Should your WCM mind its business and stick to the Web? Should your other CMSs stay with whatever enterprise applications they support? Not surprisingly, things have changed again. Two major changes are that Samsung is now a major player, and Google has finally made progress in tablets with the Nexus 7 and the much improved Android “Jelly Bean” release. Amazon’s second Fire is also more robust. There are now real choices in tablets – personally I have an iPad, a Fire HD, and a Nexus 7, and I use all three of them, and for many purposes I just grab the closest. But businesses making a significant investment in a platform for development need to carefully evaluate its stability and staying power. One thing that hasn’t changed is the debate among analysts over what the iOS and Android market share numbers mean – specifically, whether the larger and accelerating Android market share numbers threaten Apple’s dominance. At first glance it is natural to think that dominant market share signifies a safer bet, and indeed many analysts make this point. But it’s not so simple. Last year there was evidence that even though Android devices had a market share advantage, Apple devices accounted for much more total online activity – were used more – and it is probably safe to say that use is a requirement of product success. More importantly, if you look at profit share, Apple continues to dominate. So the opposing view is that Apple may be the safer bet since for most values of company/product health, profit trumps revenue. With 69% of the profits, iOS is doing just fine. More than fine, actually. Android destroyed every phone manufacturer not named Apple (BlackBerry, Nokia, Palm, etc.). Samsung destroyed every Android phone manufacturer not named Samsung (HTC, Motorola, Sony Erricson, etc.). Kirk follows up with more entertaining disdain for the “church of market share” at “Does the Rise of Android’s Market Share Mean the End of Apple’s Profits?“. For more on Microsoft see Kirk’s full post. Mobile platforms are still evolving and the coming proliferation of new device types guarantee that there will be continuous and substantial change made to those that survive. No one responsible for a mobile development strategy should wait almost a year to evaluate their current plan. Fortunately there is no shortage of useful platform data. It just needs to be interpreted critically. We have covered and written about the issues enterprises need to consider when planning to develop a mobile app, especially on choosing between native apps, mobile web apps (HTML5, etc. ), or a hybrid approach that includes elements of each. And have discussed some of the choices / factors that would have an effect on the time required to bring an app to market, but made no attempt to advise or speculate on how long it should take to “develop a mobile app”. This is not a question with a straightforward answer as any software development manager with tell you. There are many reasons estimating app development time is difficult, but there are also items outside of actual coding that need to be accounted for. For example, a key factor often not considered in measuring app development is the time involved to train or hire for skills. Since most organizations already have experience with standards such as HTML and CSS developing mobile web apps should be, ceteris paribus, less costly and quicker than developing a native app. This is especially true when the app needs to run on multiple devices with different APIs using different programing languages on multiple mobile (and possibly forked) operating systems. But there are often appealing device features that require native code expertise, and even using a mobile development framework which deals with most of this complexity requires learning something new. App development schedules can also be at the mercy of app store approvals and not-always-predictable operating system updates. As unlikely as it is to come up with a meaningful answer to the catchy (and borrowed) title of this post, executives need good estimates of the time and effort in developing specific mobile apps. But experience in developing mobile apps is still slim in many organizations and more non-technical managers are now involved in approving and paying for app development. So even limited information on length of effort can provide useful data points. I found the survey that informed the Visual.ly infographic below via ReadWrite at How Long Does It Take To Build A Native Mobile App? [InfoGraphic]). It involved 100 iOS, Android and HTML5 app developers and was done by market research service AYTM for Kinvey, provider of a cloud backend platform for app developers. Their finding? Developing an iOS or Android app takes 18 weeks. I didn’t see the survey questions so don’t know whether whether 18 weeks was an average of actual developments, opinions on what it should take, or something else. Of course there are simple apps that can be created in a few days and some that will take much longer, but in either case the level of effort is almost always underestimated. Even with all the unanswered questions about resources etc., the infographic raises, the 18 week finding may helpfully temper somebody’s overly optimistic expectations. 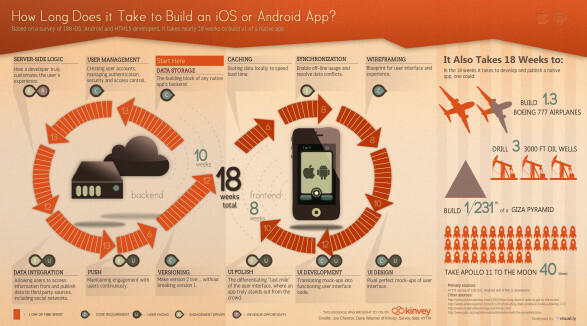 How Long Does it Take to Build an App? infographic by Angelina. Tablets of all dimensions have a role in enterprise use, as do all types of personal computing devices. BYOD is certainly a challenge for some organizations, but is a reminder of how we should have been managing data all along. One reaction to Apple’s iPad mini last week was that it would change the dynamic of Apple’s market for tablets since a 7″ inch tablet is more appropriate for consumers so enterprises would stick to the 10″ versions. The only thing correct about this view is that the tablet market will change. But we don’t know how – use-cases are evolving and there are way too many variables beyond physical size. It seems just as likely that the iPad mini form-factor could grow faster in enterprises than the full size iPad. In any case there are certainly enterprise use cases for a smaller, cheaper iPad, especially since those seem to be the only significant differences, and there is no apparent app development cost or learning curve further easing enterprise adoption. But the bigger point is that enterprises need to be able to support not only multiple tablet and smartphone form factors but a large subset of an unpredictably large set of personal device types. The BYOD continuum is also largely additive – employees aren’t just replacing devices but often using multiple devices to access and process much of the same data – keeping up with the variety and volume and versions of personal devices is hopeless. A BYOD management strategy that focuses on device management will at best have a negative impact on productivity, will certainly increase costs, and most likely fail. There are environments and applications where data security is critical enough to warrant the overhead of a device management strategy that approaches being fail-proof, but even in these cases the focus should be on the data itself with device control as a backup where it makes sense. It may not be much easier to manage the data independently but that’s the ball to keep your eye on. It was only about a year ago that the tablet market was only really about general-purpose tablets. There was the dominant iPad, and the fragmented Android market. Ebook readers were a separate animal altogether, although the anticipated release of the first Kindle Fire raised the question of whether it would bridge the general-purpose and ebook market. In some ways it did, adding enough apps and internet access that it was hard not to sneak in some work email or web research even when your laptop or iPad was purposely left at home for the weekend away with the family. But of course Amazon’s business model was/is different – a subsidized device to increase the sale of content. And Amazon’s use of Android was significantly more customized than other Android tablets. The folks over at Tech.pinions continue to be a must-read for anyone following/investing in the tablet market. John Kirk in Battle of The Tablet Business Models: Lessons Learned and a Look Ahead, argues that the future of the tablet model will be determined by the business models behind them, and points out some consistencies and lack thereof between the major players, Apple, Amazon, Google, Samsung and Microsoft. He is surely right that too often commentators and analysts have focused on hardware characteristics and software and not paid enough attention to business models. However, product capabilities can either create new business model possibilities or prevent their success so also help determine the landscape. For example, a non-glare, color display with low power requirements that combines the best of an iPad and a Kindle will certainly have a material effect on the market. In any case John’s post contains a number of nuggets. Another aspect to consider in tablet market evolution is the difference between enterprise and consumer tablet markets. We’ll look at that in another post.